If you know about any other neighborhood efforts to assist with disaster relief, please let us know and we’ll add them. SFGate has a general how-to-help list. Here’s a link to a Google Doc of needs and resources by Petaluma locals. 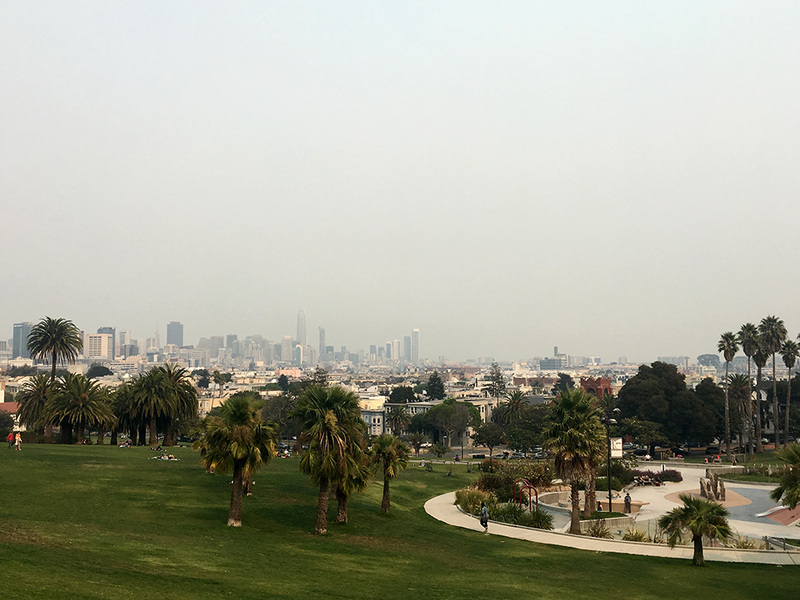 Here’s a link to a Google Doc of donation collection sites and events in San Francisco and the East Bay. California Volunteers has some general guidelines. Also, consider that some relief centers are overwhelmed with donated goods, as the Chronicle reports – the above linked Petaluma needs document notes now that no donations of goods are being accepted at any of the Petaluma shelters. 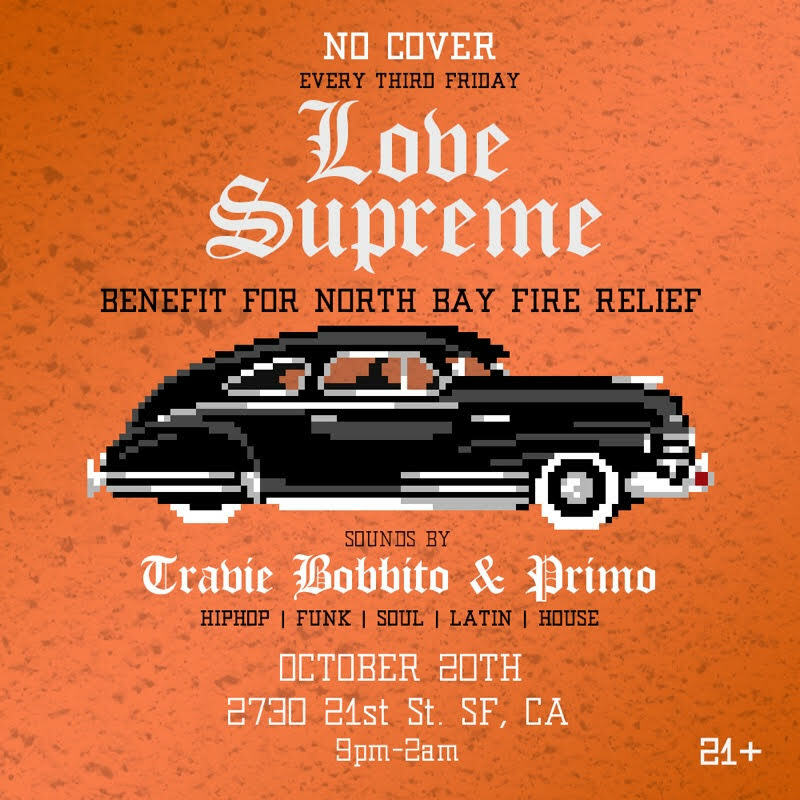 I host and DJ a party every third Friday called Love Supreme (IG: @lovesupremeSF) at Asiento. It’s a party that is rooted in culture, community, and great music and every month I find a different cause to support and this month’s cause is the North Bay fire relief. As I’m sure you’ve seen the destruction is heartbreaking and it’s going to take a lot of time to rebuild. I was born and raised in Santa Rosa, so this is something very close to me and I’m trying to help out my hometown as my much as I can. I’m donating my fee (what I earn), cash donations, and 10% of all bar sales to the Redwood Credit Union Relief Fund. Flattened cardboard boxes (New) Thank you!! Call Animal House directly and give them a credit card over the phone… 415.552.0233. Tonight! Free comedy show and collecting donations for fire victims, and raffling off great prizes! Here’s a signup portal for chefs and restaurants to provide food for those affected by the fires. It looks like some centers are still accepting goods and donations, others are not, and there are specific requests out for masks. I wasn’t able to buy any n95 masks yesterday as it seems the city/region is sold out. These are needed, especially pediatric ones, as are donations for gift cards. Petaluma evacuation centers are asking people to buy the n95 masks on Amazon.com and have them shipped directly to them. 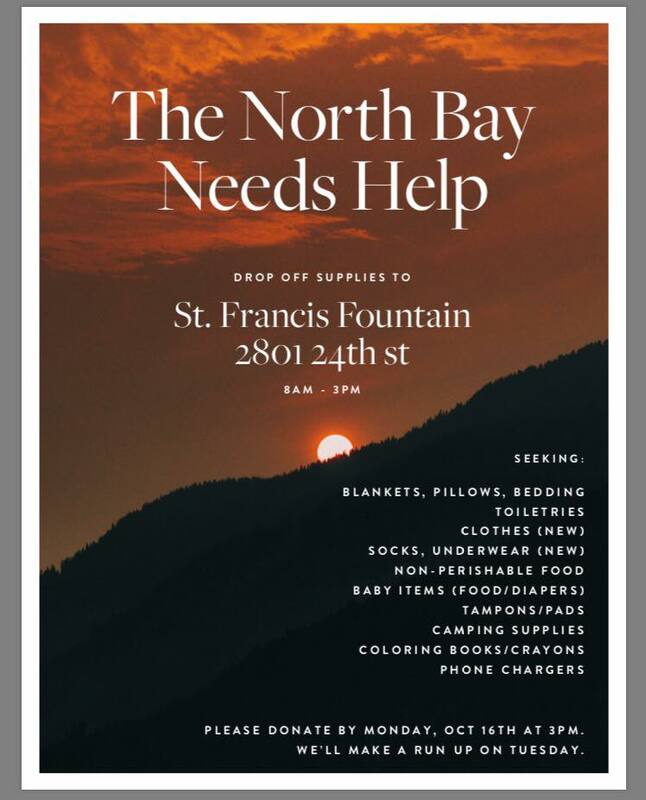 The Finley Community Center, 2060 West College Ave. in Santa Rosa, is taking new donations at the right side of the building. They need men’s and boys’ underwear. My business partner, Dave, and I drove a carload of stuff to Marin today and also donated $850. I wanted to let y’all know that they don’t need stuff anymore, but what they need are gift cards. Every donation place in Marin is getting overloaded with stuff. In-Symmetry Spa has been collecting donations since Monday, and we have more coming in, but we are starting to turn people away until we find out exactly what the victims need. The fire is still at 0 percent containment. Thank you all for your outpouring of support. Regrettably, we are at capacity for storage of donated items after just one day! While we will not be receiving donations of items, one recommendation we have is to donate gift cards that we could donate to local families and shelters. College of Marin’s Student Activities and Advocacy Office will be purchasing small-denomination gift cards to chains like Target and Safeway, as we know those stores are readily accessible with large variety of items that families can use right away. Many thanks to In-Symmetry Spa and their customers, the San Francisco and Marin communities, and all people that stopped by our campus to donate today. We’ve shuffled our storage warehouse and are now sorting and packing items to be donated the rest of this week. We will be removing items from this list as the donation time window closes.